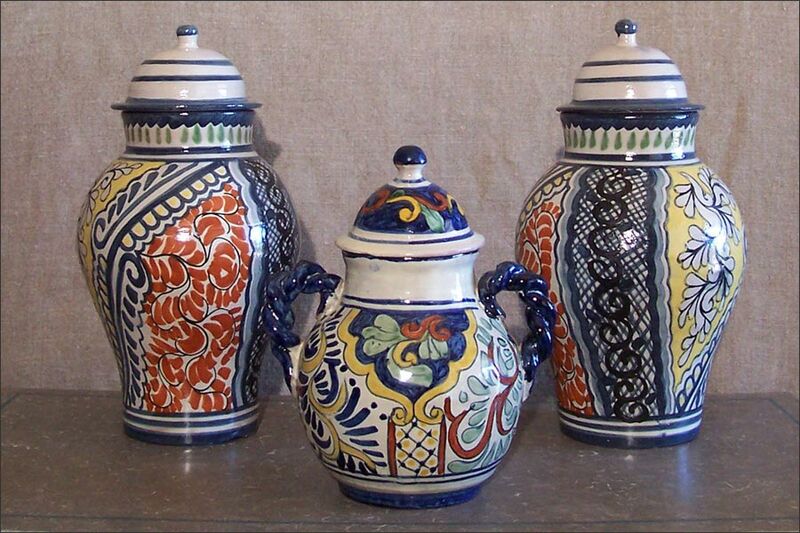 These Lidded Ceramic Jars are all about Adding Color and Pattern to One's Environment and Home Decor. Probably Mexican Wares, and Glazed in an Almost Matte Finish with Appealing, More Subdued Colors; not the Shiny new Mexican Ceramics with Glaring Color. Blue, Yellow and Cinnamon Color the Larger Jars. The Handled Jar has Leaf Motifs in a Subtle Green. These Ceramic Lidded Jars would Compliment S.W. Furnishings and Decor, as well as Eclectic and Ethnic Interior Spaces.